6. A critical aspect of truth-telling involves being a part of a larger conversation. Parker Palmer, author and founder of the Center for Courage and Renewal, said, in a FFW interview about vocation, “Truth isn’t in the conclusions of the conversation, because the conclusions keep changing. If I want to be in the truth, I have to be in the conversation.” In other words, it isn’t just about digging deep inside of me and writing about what I find. 8. I have great hope for Christian publishing. I attended a panel discussion on The Next Generation of Literary Publishing. By the time I left, I felt like I had spent the past hour in an oxygen tent. If you don’t know them already, make sure you check out these literary journals and small presses: The Other Journal, Ruminate magazine, Relief, Wipf & Stock, Word Farm. 10. I have great hope for my alma mater. I had a wonderful, rigorous educational experience as a student at Calvin College, but I’ve been…hmm…let’s just say a bit disappointed in the institution since graduating in 1992. I don’t know if all of my characterizations have been fair, and I don’t want to get into them here—at least not right now. 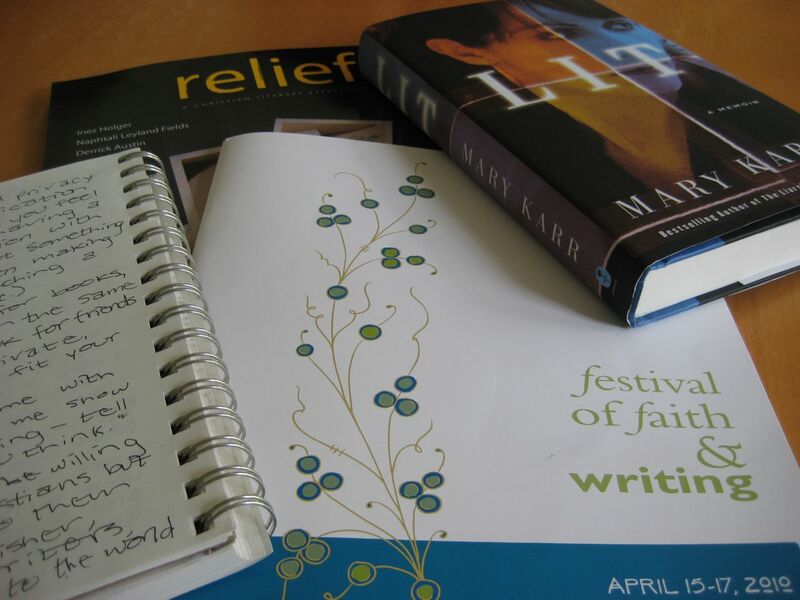 :) I just want to say that the conversation I participated in at the Festival of Faith and Writing was broad and deep, smart and honest, and yes, even diverse (as diverse as it could be and still be a foundationally faith-based conversation). Many of my beloved Calvin English professors organized the conference, reminding me what made my education there so great, and giving me a renewed sense of hope in Calvin College’s role in the larger conversation. Wow, that sounds like a fantastic event. I should plan to attend the next one! I find your first note the most interesting — although, like you, I think I already knew that. I’m pretty excited about the future of Christian publishing, too! A great concise view into your conference. Sounds like you picked good sessions and they all flowed well together (or at least in the telling). I’m finding it challenging to write up summaries of my conference, so I appreciate this all the more. ;-) I’m glad you have renewed hope and new contacts. What a blessing for you that will ultimately be shared with us. Great quotes and lessons from the conference. Thanks for sharing. I was so bummed I missed it this year, but hopefully next year! Mennonite in a Little Black Dress is brilliant. My wife was laughing out loud. Thanks for coming to the small press panel! I organized it – and even I learned some new stuff. This is a great recap! I was in the session with the small publishers too and I LOVE, love what they are doing. And I echo your sentiments on #9, in fact, I’m off to go read now! Kathleen, yes, you should definitely try to keep mid-April 2012 open—I would love for you to benefit from all the thought-provoking and spirit-stirring exchanges happening there (and I’d love to meet you in person, too!). Lorna, that’s one of the good things about being on Twitter and having a blog: I feel somewhat obligated to process and organize my thoughts after an event like this, so I can share them. It would be otherwise so easy for me to come home, exhausted, file my notebook away, and never look at it again. Thanks for being one of the people who was interested in hearing more about my experience! ed, I wish you could have been there, too, but I’m glad I was able to at least give you some tastes of my experience. Can’t wait to read “Mennonite in a Little Black Dress.” In person, Rhoda Janzen was such a perfect blend of funny and insightful. Hannah, you did such a great job with the panel! I’m so glad I was there—I really needed that breath of fresh, invigorating air. Btw, your Jesus Girls book was one of the purchases I made at the conference. I’m looking forward to reading it, and would love for you to keep me posted on what you’re up to next. Great read! Thanks for sharing your thoughts. Wish I could’ve been there. Wow, girl. You were really paying attention! Great thoughts, and I have no doubt you will apply what you’ve learned to your already stellar writing skills. It was a joy meeting you in person, and I look forward to doing it again sometime. Keep me posted on your progress with the book. I see the negatives as blessings, though they’re usually very hard to accept as such when they’re happening. Carmen, you would have enjoyed it—so many talented writers and so much thought-provoking discourse. Rachel, well, it’s easier to pay attention when you’re not one of Zondervan’s big new authors. :) You had a lot of serious networking to do. I’m so glad we were able to spend time together, too, and can’t wait to read your book! Love the quote from Vito from the Welcome Wagon. Must write that one down. Fabulous concert by the way, I owe you one for that!